With this year’s Consumer Electronics Show (CES) and Macworld just around the corner, let the rumor mongering and product “leaks” begin. Today’s news (Engadget) is that users of Sony’s PlayStation Portable will soon be able to make Internet-based telephone calls and send messages over Skype’s network. Interestingly, the source of the “leak” is Sony’s own official CES preview page. 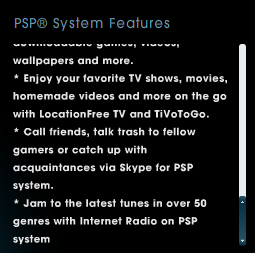 This isn’t the first time Sony has sought to add VoIP functionality to the PSP. Last May, Sony Europe announced that they had teamed up with British Telecom to bring voice calls, video conferencing and IM functionality to users across Europe. However, Skype has a huge installed user base, much larger than BT’s own ‘softphone’ products, and presumably will be offered to users in the U.S. and other parts of the world, not just Europe.